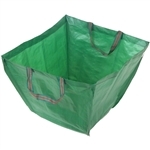 Dark green semi-rigid tote bags for hauling yard and garden materials and debris. Lots of other outdoor and indoor uses. Stands open during use and folds flat for storage. Made of especially tough, woven polyethylene with extra strong handles. There is a third handle near the bottom to make dumping easier. 31" diameter x 18" deep, holds 8.2 cubic ft. 23" diameter x 18" deep, holds 4.6 cubic ft. 31" diameter x 18" deep, holds 8.2 cubic ft.